some great stuff in there. Congrats. If you ever feel like letting go of that Return to NY page, let me know. I'll give you a fair price. You have some great stuff. I love those layout pages for issue # 1 and that RTNY page revealing Zog is awesome. Always nice to see some new artwork. Thanks... 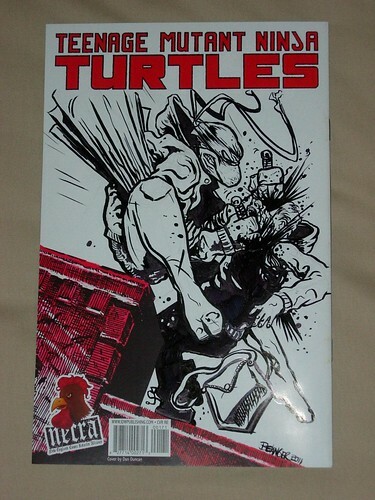 I need to add in the NECRA edition #1 that has art on it, I'll probably do that when my Eastman sketch #1 arrives. - "You want a fist in the mouth? I've never even looked at another guy"
Some solid oa there. Very nice. Love when new stuff comes wandering out of the void! 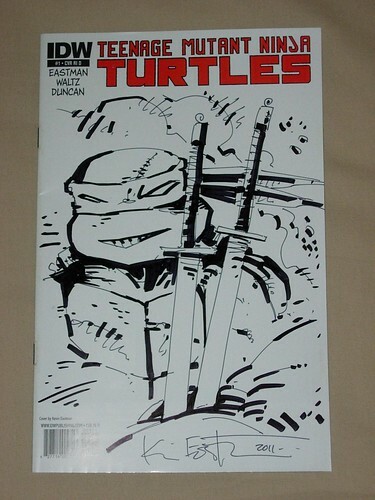 Now I have both and taken photos... art on the NECRA issue, and my Eastman sketch #1.
who is the Necra artist? Andy Belanger I believe. 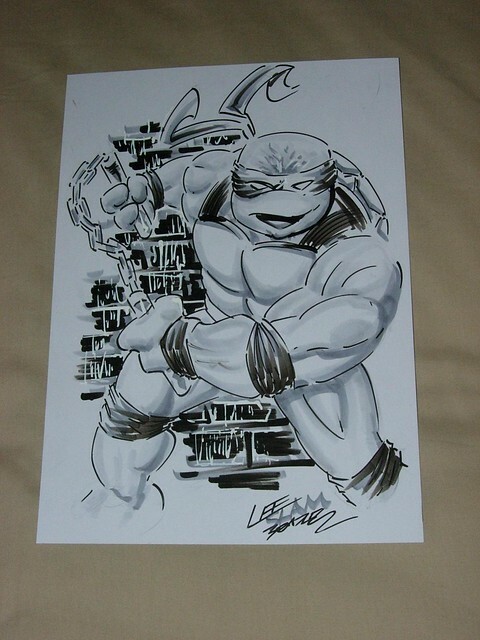 The art was done at the TMNT launch party. I got it a few months back, I can't remember if that's the correct person heh. Last edited by Mayhem; 03-14-2012 at 03:58 PM. 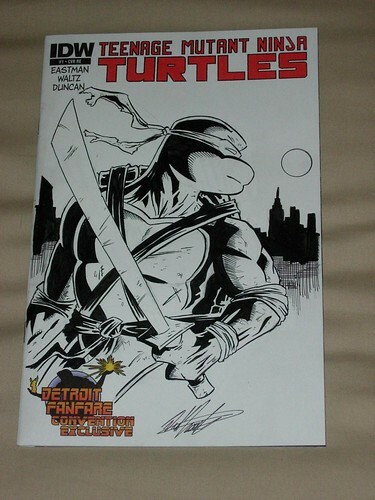 Forgot to put in here... piece by Lee Bradley from the London SCC, who worked on some of the Titan UK TMNT stuff. Absolutely love the Smash-Up Comic-Con poster. "When It's Time To Party We Will Party Hard." six TMNT#1 layout pages......you greedy sod , i also really dig that original artwork of the SDCC09 mirage jam print, you have a great collection there. The layout pages were sold as two groups of three (doesn't take a genius to figure out the groupings) and I was a bit surprised at the time (I want to say 2005 here) how "little" they actually cost me. By comparison, the Mirage jam print original art was a lot more publicised, on eBay, and I guess open to a lot more people. That cost me roughly the same as what it cost to buy ALL six layout pages! Mirage don't ship outside North America, so I had it sent to a very good friend instead, one that I've been to SDCC with a number of times. So I didn't collect it until just before SDCC 2010, and took it along with me, and ended up showing Michael Dooney that I had it heh.